A Birdbath for the Birds! Our Products >> A Birdbath for a Trio Birds! 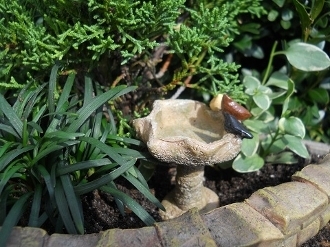 A Trio of Birds birdbath for your Fairy Garden Store miniature garden. Dimensions: 2½” Tall. Item#:TBB7740. Product Info: Resin. A Birdbath for a Trio Birds!